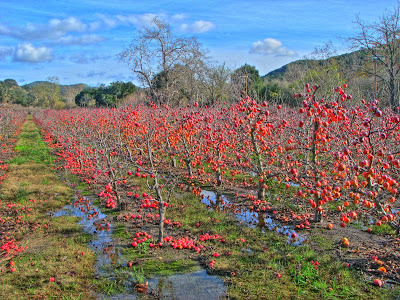 The other day, I posted some photos of Avila Beach covered in apples. This was the result of a flooded orchard that had been stripped of its fruit with the resulting debris washing up on the beach in the same manner as seaweed. We were back at Avila today and I noticed something equally odd. I found a different apple orchard that had flooded, but instead of taking the fruit, the water had removed all the leaves from the trees, but left the apples on the branches. This produced the very odd scene shown in these photos I took. 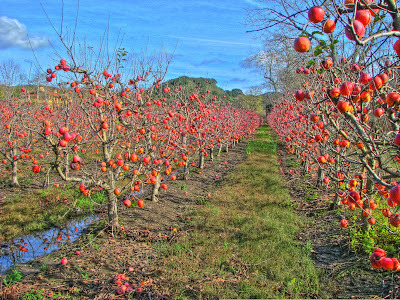 Rows upon rows of trees with only the fruit remaining. It was so funny looking, almost like they were decorative topiaries instead of living plants. I see bigger trees in the back ground that don't have leaves on them. Roger, in our area, the weather is so mild that trees will sometimes drop their leaves a few times a year and then grow them back if we get some random cold spells. This area has some sycamore trees down by the creek, but the hills are covered in oak. I would not trust the apples either, but I don't think they will use these apples. This "farm" is not all that large and sits in front of three homes. I think it's more of a tax write off than a real farm. Many of the wealthier people around here have these rather unproductive gentleman farms. Some of them don't even harvest much of what they grow. That would be such a shame. letting the produce go to waste on a normal year. A lot of hungry people in the country that would be happy to make use of the unused stuff. Roger, it is a shame. Government is partly responsible for giving tax breaks to "farmers" who really aren't. I know people out here who will put three llamas on their property and call it a ranch or people that grow an acre of peas and call it a "farm." The federal government really needs to stop this crazy central planning. The other people I blame are lawyers. There's this driver I know who picks up all the day-old produce at the grocery and he says the homeless shelters won't even take it any more. They're afraid someone will sue if they serve food that is a day past the "sell by" date. So I take a lot of it off his hands. We've used some of it on our Scout outings and some I give to neighbors too, but there's so much that just becomes mulch. 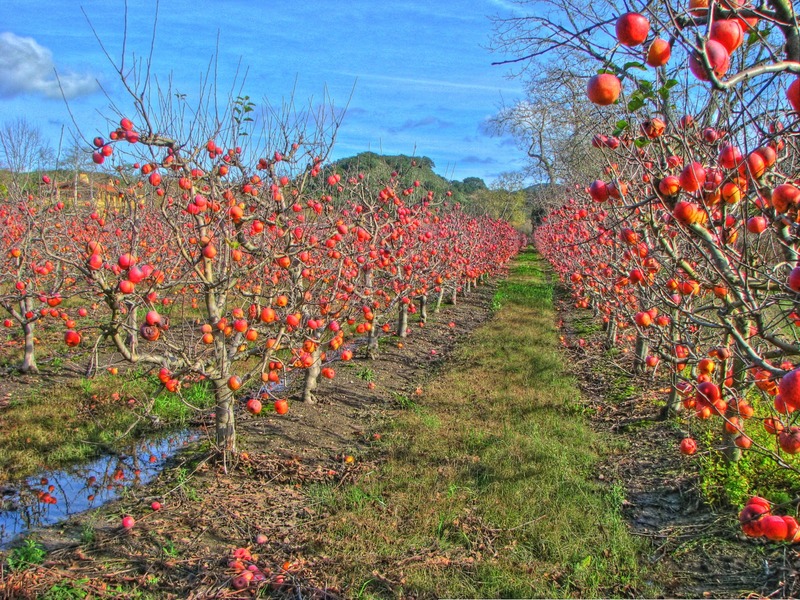 In Toronto, Canada, "Not Far From The Tree" is a group of volunteers who help collect urban harvests - maybe some volunteers in your area could organize a collection of the fruit for those who need it such as food banks or other such charities when there is no flood? Astrocrabpuff, I'm forwarding your idea to a friend of mine who organizes several NPOs in our area. Thanks.